Understanding the mobility of H at the surface of carbon nanostructures is one of the essential ingredients for a deep comprehension of the catalytic formation of H2 in interstellar clouds. 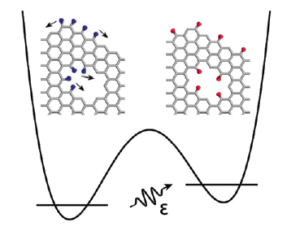 We combined neutron vibrational spectroscopy with DFT molecular dynamics simulations to study the local environment of H structures chemisorbed at the surface of disordered graphene sheets. At 5 K, the ground state is composed of large clusters of hydrogen chemisorbed at sp2 carbon sites, on the edges and in voids of the graphene sheets. At temperatures of 300 K, a high degree of dispersion of the clusters is observed, involving the breaking and reforming of covalent bonds which, at low temperatures, is mediated by incoherent tunnelling of hydrogen (Phys. Chem. Chem. Phys. 2016). This entry was posted in Graphene. Bookmark the permalink.